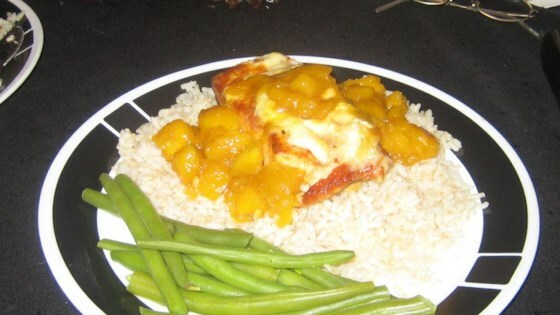 "Delicate salmon is topped with a wonderful combination of mango and Brie cheese. The best part is that the Brie bakes with the salmon. Wonderful with a spinach salad and fresh bread." Heat the olive oil in a large oven-proof skillet over medium high heat, and sear the salmon about 4 minutes on each side. Top salmon with Brie cheese. Cover skillet, and place in the preheated oven. Bake 15 minutes, or until the salmon is easily flaked with a fork. In a saucepan over medium heat, melt the butter and simmer the mangos 15 minutes, or until soft and smooth. Serve over the cooked salmon. See how to make pan-seared salmon with a simple, semi-spicy mango relish. This recipe was delicious! So flavorful and easy. The only thing I would suggest would be to add a dab more brie on each piece of salmon a couple of minutes before it's done baking.